According to the Pew Internet and American Life Project, as of April 2012, 53% of American adults age 65 and older use the internet or email. I don't have the figures for Malaysia, but based on a simple survey of the people I know or have met, I am inclined to think only a very small percentage of seniors here are internet users, and of those that are, the majority probably don't go online on a regular basis. Many have no interest at all in wanting to learn how to use the internet. Their reason (excuse)? "I'm too old to learn." Which is sad, because there will come a time when their only connection to the outside world, to their family and friends may well be via the internet. Why do I say that? Well, this illustration above from AARP clearly explains why. Like it or not, as the years pass, we will find it increasingly more difficult to get out of the house for a trip to the shops or have coffee with friends. Already we are seeing this happening with our elderly parents. We are social beings. We need to be in touch with people. Having a network of friends to spend time with and meeting people keeps us going. But when you spend much of the day alone, loneliness soon creeps in. From there, it is only a matter of time before you sink into depression. You can be living with your family. But with everyone so busy with their own interests, there is hardly anyone at home who has the time, the patience or the interest to sit down and have a chat with you. 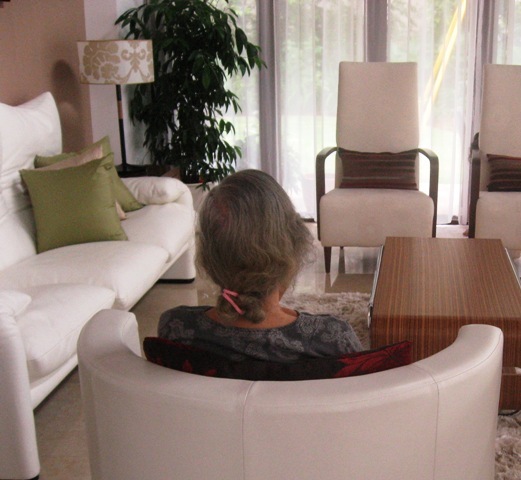 For the widowed, the loneliness leaves an emptiness that is hard to fill. You need someone of your age group that you can confide in. So while you are still physically able, get out more. Go on a trip with your friends, catch a movie, attend a concert, volunteer for a community project, sign up for classes. Life is for living, whatever your age. Be IT-literate. Learn to use the internet for social networking and emailing because one day that might be your lifeline to staying connected with your friends. And while you are learning to use the internet, you might as well learn how to use a smart phone or an iPad. Your children will either get you one for your birthday, or pass you theirs when they upgrade to the latest model. 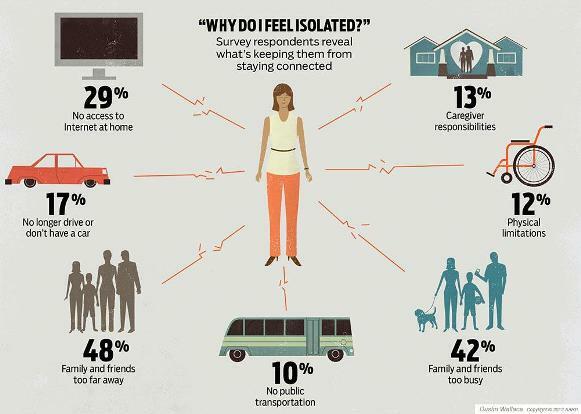 They will want to stay in touch with you, to make sure you are okay at home. Embrace the digital world. Learn the basics. You really have little choice, unless you want to spend your retirement years in social isolation. Lily, using the Internet also has its pitfalls. There are a lot of scammers out there, including identity stealers! As for scammers... every human who has ever paid income tax or allowed his or her child to be recruited into the army to kill or be killed is already victim to the greatest scam of all - government! Anonymous, I have written several warnings about scammers over the years. You can do a blog search for them if you are interested. 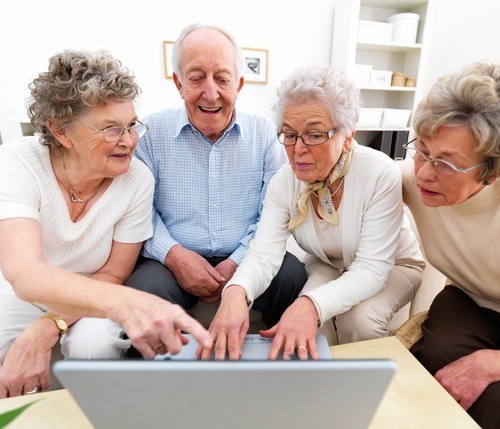 "....I am inclined to think only a very small percentage of seniors here are internet users, and of those that are, the majority probably don't go online on a regular basis...."
No wonder there are so few of us here. While it is good to interact via the internet it is the grind to get through the days that matters most. At this stage seniors need to be living in a community of like minded people, not in elderly unfriendly main stream society. Like a retirement village where besides having buddies to engage in our daily activities of mutual interests they can look out for each other. They can even help run their own nursing homes within the village with a view that one day they might have to 'graduate' to. Or, for the sandwich seniors who still have parent(s) who need nursing care it would be ideal to have your parents nearby with other volunteers seniors coming in to assist. Besides if there is economy of scale it can be self-contain and all amenities providing basic necessities can be housed within the village. Mahjong, chess, tai chi, qi gong, karaoke, trips or even organic gardening, anyone??? With this arrangement they can relieve their caring children of having to worry about them knowing that their parents are in good company. Ben, everything you have brought up has been covered in previous posts. Do a blog search for 'retirement villages/homes/resorts'. For a start, you might want to check out http://seniorsaloud.blogspot.com/2010/04/housing-options-for-retirement-years.html. One thing about the reticence of Malaysians in posting their comments is that in many cases they can be met with irrelevant replies!! That's quite off-putting to some! As a serial commenter, I'm not put off. Once we do any posting, we must be prepared to agree to disagree! And be ever ready for a lively repartee. I think that politics is one thing that just cannot be ignored. No matter how hands-off a blog wishes to be. It's the lifeblood of the people and the country! Just about anything in the daily lives of the people will touch on politics!! Ignoring politics has serious consequences. Perhaps that's how this country got to be in the mess it is in today. Because, those in the early years of independence refused to be bothered by what the government has been doing, with the excuse that "it's like that"!! Meaning that nothing will change! What they fail to see is that change must come from them; if they don't part-take to ensure change for the better, then everything will just drift like a rudderless ship. But hopefully things, they are a changing now!!! Now, talking about posting anonymously on the Internet. It has its good points. In strive torn Mexico, having a blog or even posting comments on one can be very dangerous. Because, just one critical word about the drug cartels can bring very serious consequences. And many of their bloggers have found that to their detriment. Their comments were traced and they were dealt with "properly"
Now, just in case anyone want to say that that country is half a world away in Mexico, I would like to add that the above is just an example; an extreme example. And if anyone is not aware, our country has recently arrested some Mexican drug traffickers . It won't be surprising that they are looking for a beach-head here. I am among the small percentage of "retirees" (66+) who make full use of the Internet and social network. I do visit your very interesting blog very frequently. We keep on learning everyday. so I highly recommend learning to get online to anyone --- one is never too old to learn something new everyday! Hi, Tony, nice to hear from you again. If only more seniors would take to the internet like you, and enjoy the wealth of information and social connection that it offers. Your blog is an inspiration to seniors! Regards to Suzanne. Sorry for sounding so 'glass half empty'. Was responding to the statement "....I am inclined to think only a very small percentage of seniors here are internet users, and of those that are, the majority probably don't go online on a regular basis...."
I know a lot was written about the 'retirement village' concept in this blog and also in our main stream media. Most are trying to 'sell' the idea of 5- star concept lifestyle retirement that is beyond the reach of many average Malaysian Joe or Jane senior citizens. I see a decent and functional retirement home in a self contained community setting. One that is affordable. And, obviously our business people would view the word 'affordability' as a dirty word or interpret it to suit their bottom line. We have a ministry whose purview we come under and who, with all the resources at its disposal, can make it happen but thus far all I can feel is a 'deafening silence'. But they allowed us to be exploited by the unregulated for profit only nursing homes (horror stories are a-plenty).